DUBAI: Stand-in captain Rohit Sharma praised his bowlers after India thrashed arch rivals Pakistan by eight wickets in their Group A clash of the Asia Cup cricket tournament here on Wednesday. Asked to field first, three-wicket hauls from pacer Bhuvneshwar Kumar and part-time off-spinner Kedar Jadhav enabled India to restrict Pakistan to a paltry 162. Bhuvneshwar returned figures of 3/15 while Jadhav got 3/23. Pacer Jasprit Bumrah also picked up a couple of wickets. "Right from the start, we were quite disciplined. We wanted to learn from the mistakes which we made in the last game. Today was a great game for the bowling department because I knew the conditions weren't great for it. But we kept the conditions aside and did the job. 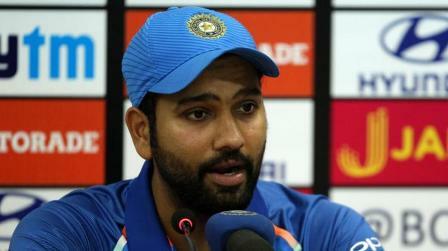 We stuck to our plans," Rohit said after the match. "Lots of improvements from the last game, spinners kept it tight, got the odd breakthroughs. The bowlers took wickets early as well. It was important to do that because we wanted to make sure not to make things easy for them. We spoke about not giving room to the batsmen and it worked," he added. "The first few overs were disciplined and the spinners took over. Once they had a partnership, we discussed not to panic and it was important to just stick to the plans." Rohit, who took over the captaincy after regular captain Virat Kohli decided to skip the tournament, picked out Jadhav for special praise. "He (Jadhav) has been working on his bowling, takes his bowling very seriously. Every now and then, he does the job which is crucial," he said. Rohit also played a crucial role in India's victory. He smashed a quickfire half-century and his 86-run opening stand with Shikhar Dhawan saw India overhaul the target with a whopping 21 overs to spare. "Enjoyed the little innings that I played, got out to a great delivery. We haven't played here much and we have understood how to plan on such pitches. Opening partnership sets the key on such tracks and it was a fine finish by Dinesh and Rayudu," he said. 2 kids washed away in MGR Nagar?